Many folks have asked me about the Walt Whitman quote I’ve included in the header of this blog. So, I thought it might be useful to spend my “return from the posting drought” post talking about the quote, its author and how I came to include it on this blog. The great American poet Walt Whitman is closely associated with the Civil War through both his work as a volunteer nurse in the Washington hospitals and his writings about the war. Whitman, a staunch supporter of preserving the Union, decided to make his contribution to the war effort by serving in hospitals around Washington following a visit to see his brother, George Washington Whitman, who had been slightly wounded during the battle of Fredericksburg in December 1862. The younger Whitman was serving as a first lieutenant with the 51st New York Infantry Regiment at the time of the battle when he was injured by artillery shell fragments to his jaw. While his injuries were not serious, Walt rushed to Virginia to confirm the extent of his brother’s wounds and provide care for him if necessary. Finding his brother well, Whitman set about visiting the Union hospitals in and around Fredericksburg. What he experienced there moved him to action, ultimately causing Whitman to volunteer as a nurse in Washington upon his return. Back in Washington, Walt was eventually able to secure a series of jobs with the federal government and spent much of his free time working in the military hospitals. A good deal of his volunteer work was done at Washington’s Armory Square Hospital where he labored numerous hours by visiting and providing morale boosting activities for the young soldiers who were sick and wounded. The poet read to the soldiers and even wrote letters for them to family members and friends. One of the soldiers Whitman encountered at Armory Square was a 21-year old member of the 141st New York Infantry named Erastus E. Haskell. Erastus Haskell was a carpenter from Elmira when he enlisted in the 141st New York on September 11, 1862. 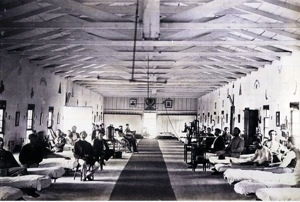 Much like Oliver Case, Haskell’s initial entry training was soon interrupted by illness as he contracted typhoid fever spending much of his first ten months with the regiment in field hospitals before finally being admitted to the Armory Square Hospital on July 11, 1863. By Whitman’s own account, the young soldier’s health began to progressively decline after his admission to the hospital. 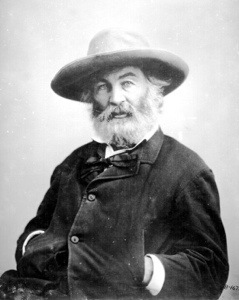 Whitman remained close to Haskell providing him comfort and even attempting to improve his medical care by imploring the attending physician to action. Even with Whitman’s intervention, Erastus Haskell’s condition soon grew critical and he succumbed to the fever on August 2, 1863. You can read the entire Erastus Haskell letter – Walt Whitman here. When I first read this letter several years ago, I was deeply moved by Whitman’s compassion for the parents and his willingness to express his emotional connection to their son. Moreover, I was particularly impressed by the tribute aspect of the letter. Whitman had seen so many soldiers come into the Washington hospitals…never to walk out. Most were not heroes of some great battle. In fact, many were just like young Haskell, never seeing the battlefield due to their own personal fight with one of a myriad of diseases lurking in the soldiers’ camps. As readers of this blog know, Oliver Case came very close to death (Death Comes Calling – Oliver Cromwell Case) as a victim of disease before he eventually died from a Confederate musket ball at the Battle of Antietam. This entry was posted in Uncategorized and tagged death, disease, Erastus Haskell, hospital, Walt Whitman. Bookmark the permalink. I'm a retired Army officer dedicated to telling the story of Private Oliver Cromwell Case, 8th Connecticut and the encounter of the Wiggins Family with Sherman during his March to the Sea. I welcome your interest in these stories.